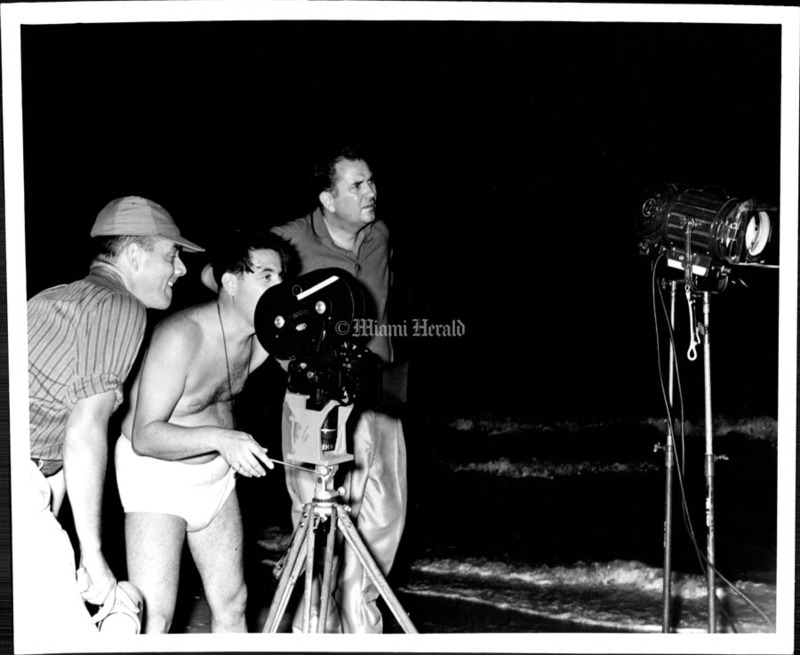 The movie industry’s infatuation with South Florida’s exotic tropical landscapes and year-round sun started in the 1940’s with classics like Moon Over Miami and Key Largo. 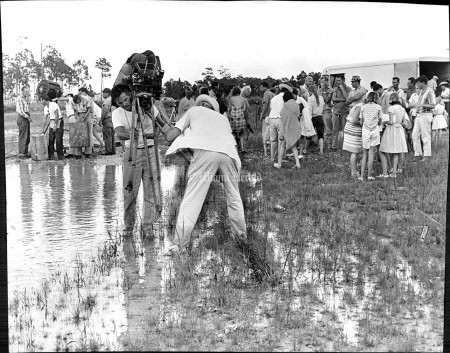 In the ’60s, Florida’s fun-in-the- sun image brought in movies like Where the Boys Are. During this time, the the Jackie Gleason Show was filmed in Miami Beach until the end of its run in 1970. 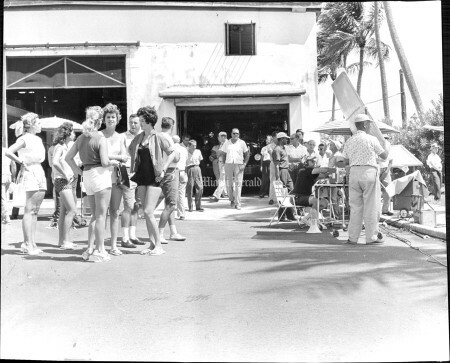 Ivan Tors Studios’ Flipper, in the mid-’60s, and Gentle Ben, in the late ’60s, were also filmed here. By the late ’70s, Miami had become a land awash in crime, runaway immigration and fear. As the area’s landscape changed, TV and filmmakers brought controversial projects such as Scarface and Miami Vice. 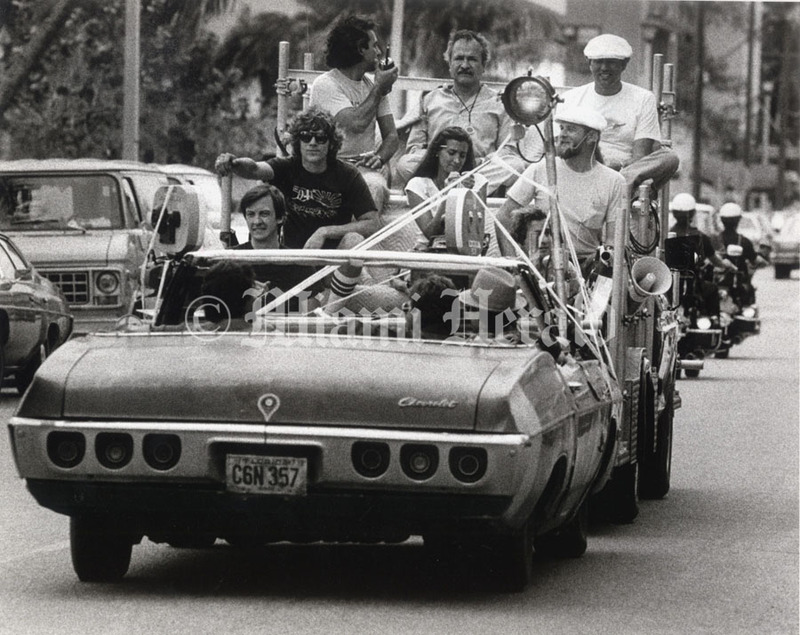 Local politicians initially fretted that these productions – with their fixation on illegal drugs, prostitution and police corruption – would reinforce Miami’s checkered image. Instead, they helped fuel a cultural and economic renaissance. During the 1990s, Miami-Dade teemed with film production, luring blockbusters like True Lies, There’s Something About Mary, Ace Ventura, The Bodyguard and Birdcage. The boom encouraged Broward and Palm Beach to build larger studios of their own. 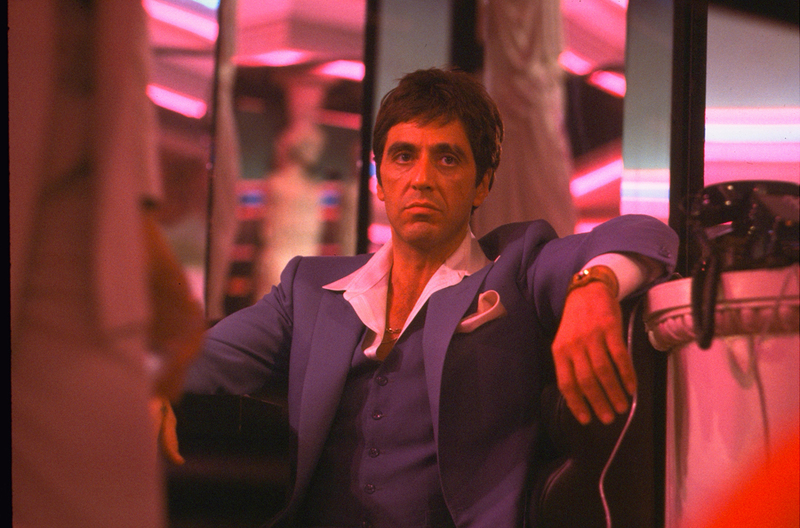 1983: Al Pacino in "Scarface." 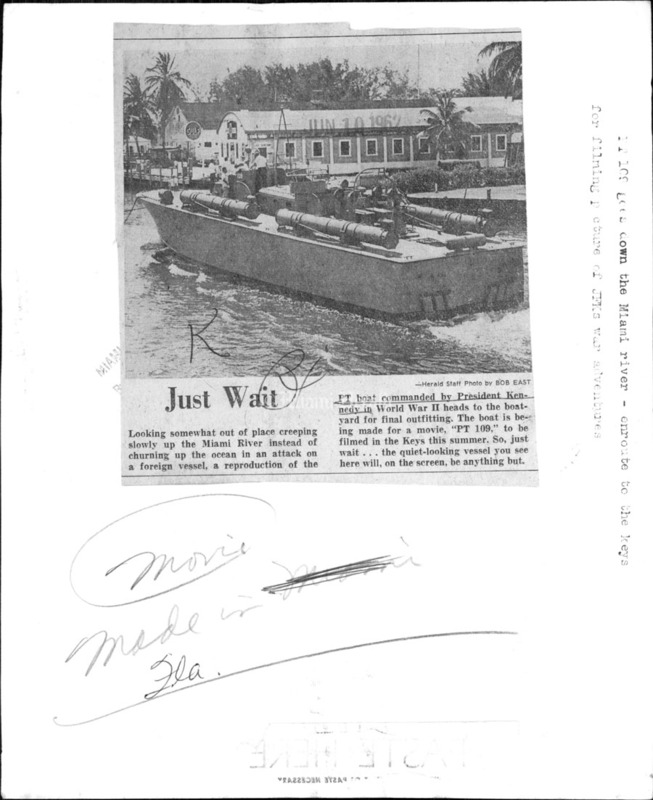 6/10/1962, Bob East/Miami Herald Staff: Just Wait. Looking somewhat out of place creeping slowly up the Miami River instead of churning up the ocean in an attack on a foreign vessel, a reproduction of the PT boat commanded by President Kennedy in World War II heads to the boatyard for final outfitting. 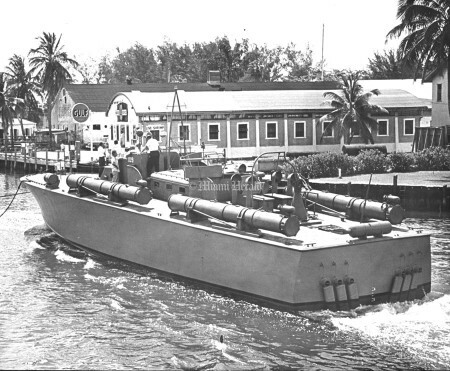 The boat is being made for a movie, "PT 109," to be filmed in the Keys this summer. So, just wait. The quiet-looking vessel you see here will, on the screen, be anything but. 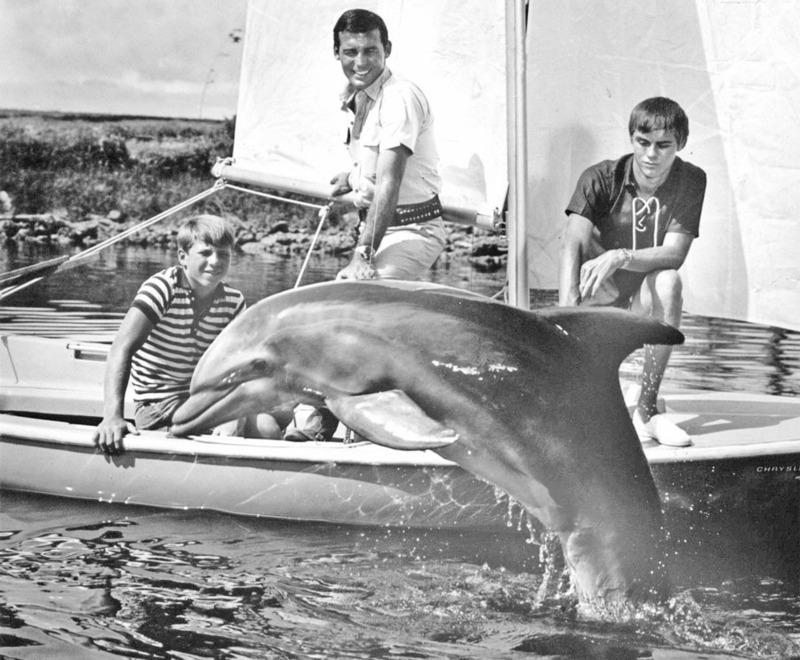 1965: The "Flipper" series, which ran from 1964 - 1967, employed seven dolphins to play the lead roll with Tommy Norden, left, Brian Kelly and Luke Halpin. 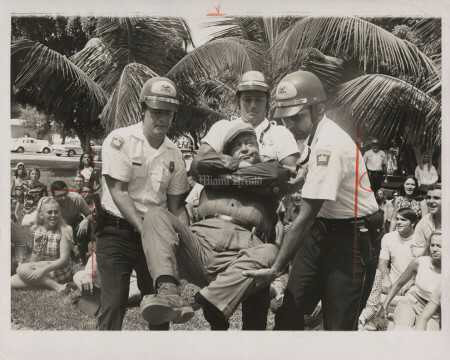 1/24/1969, Bill Sanders/Miami Herald Staff: The title "How I Love Thee" seems to be incongruous here as Jackie Gleason gets carried away in a scene from the movie. 11/05/1983-Connie Francis and George Hamilton in "Where the boys are." 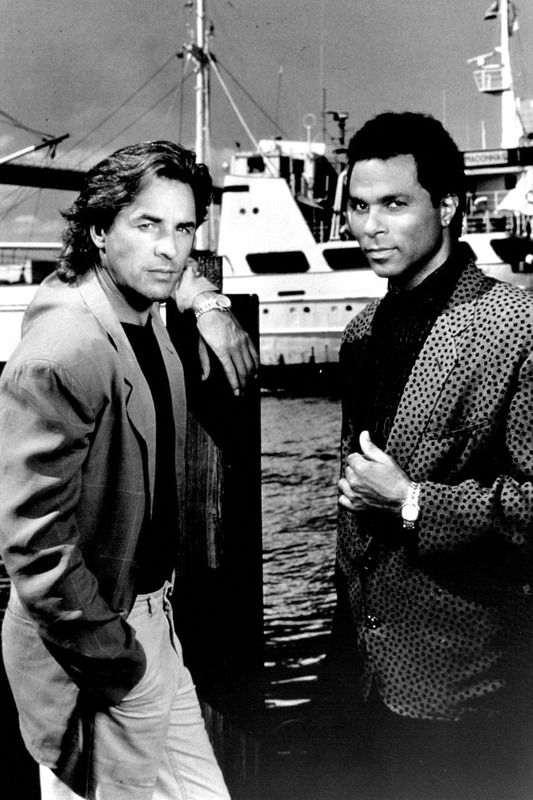 5/21/1989: Don Johnson and Philip Michael Thomas of Miami Vice. 2/22/1962, Minerva Wagner/Miami Herald Staff: Pier Footage. 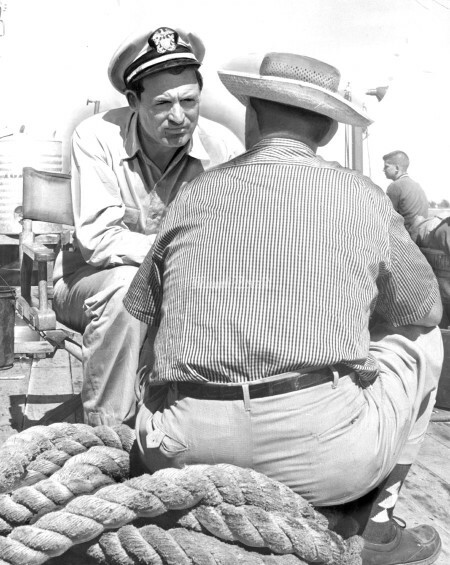 Fort Lauderdale's hardworking visitors, the Columbia Pictures' company filming "Safe at Home," shifted operations from Lockhart Stadium to Pier 66 this week. All hands were on deck for the filming of the movie's nautical scenes. 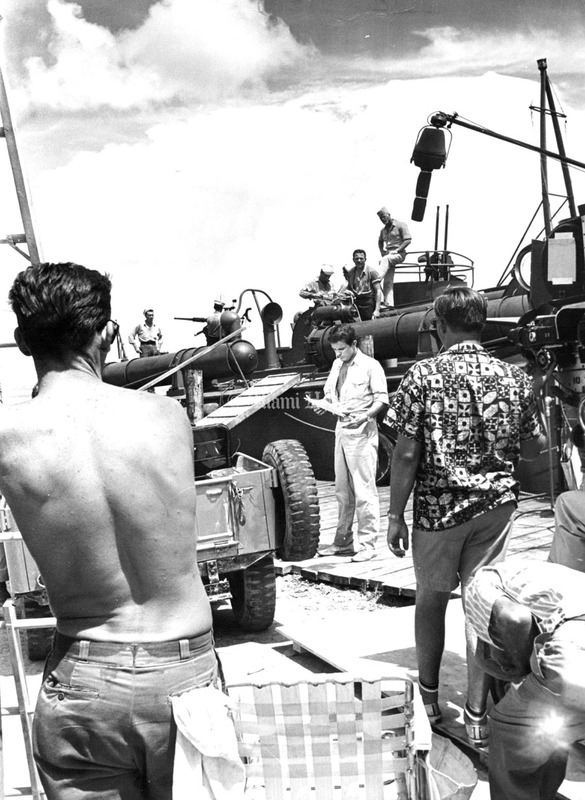 7/19/1962: Cliff Robertson studies his lines on set on Munson Island for "PT 109". 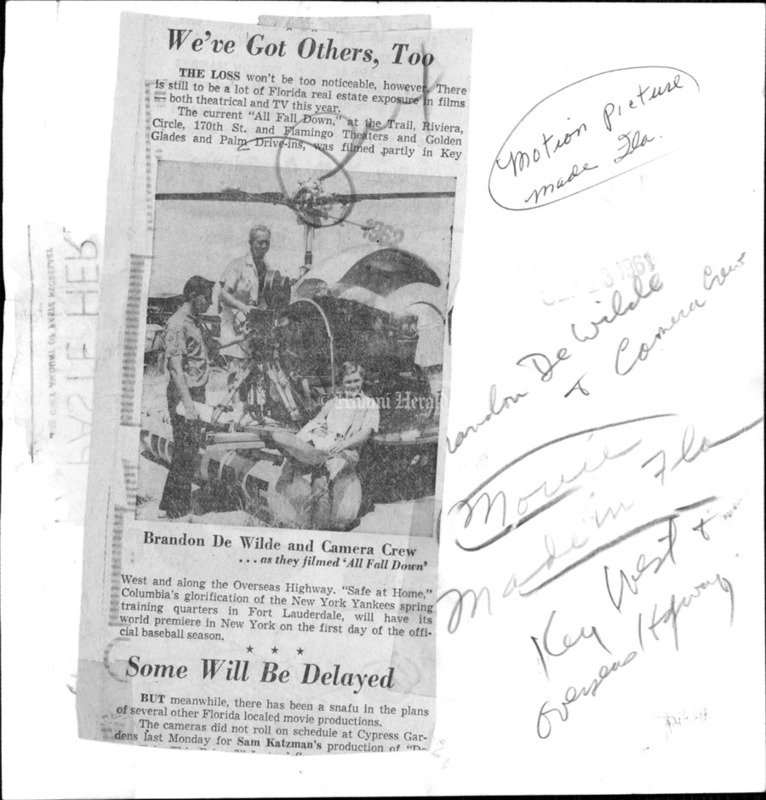 2/4/1959, Doug Kennedy/Miami Herald Staff: Cary Grant and producer of Operation Petitcoat. 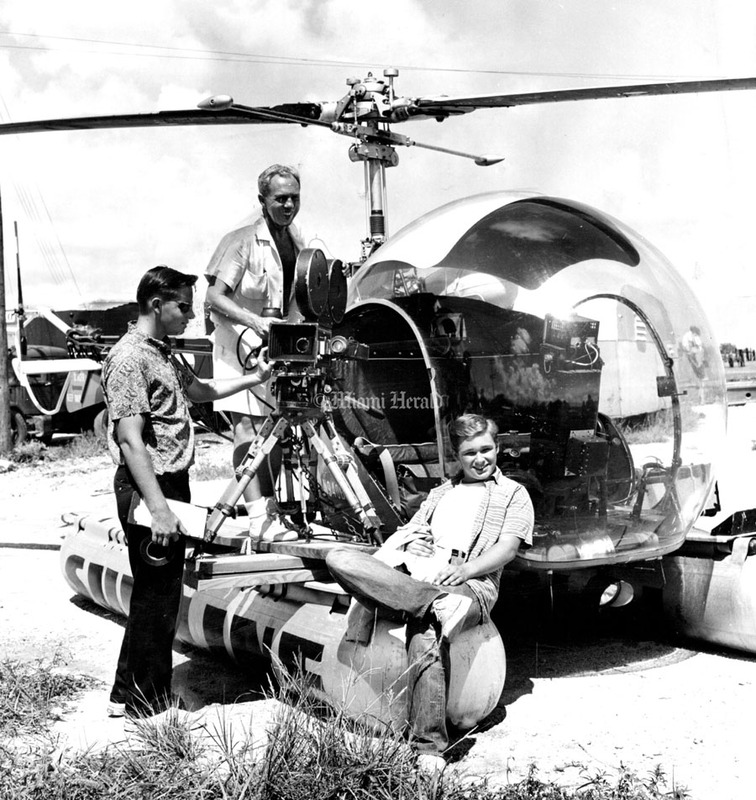 1/1/1962: Brandon De Wilde and camera crew as they filmed "All Fall Down". The movie was filmed partly in Key West and Overseas Highway. 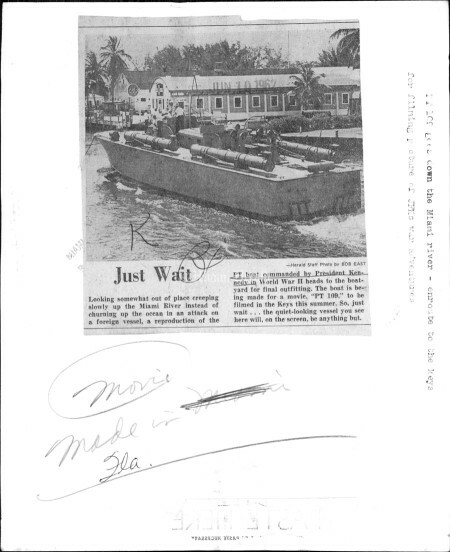 8/13/1958: Home That Is Not a House. Burl Ives "Castle". 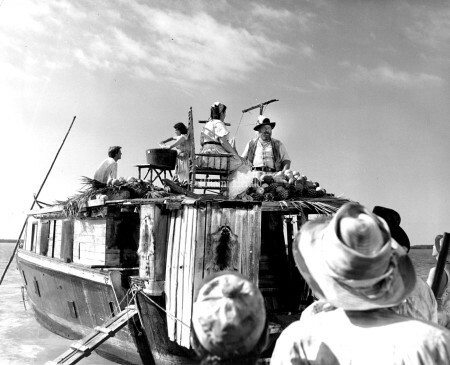 'Wind Across the Everglades' premiere promises to be Real Hollywood affair. The first Miami world's premiere of a major made-in-Florida motion picture about Miami and its River of Grass environs will mark the peak point of the entertainment week ahead. 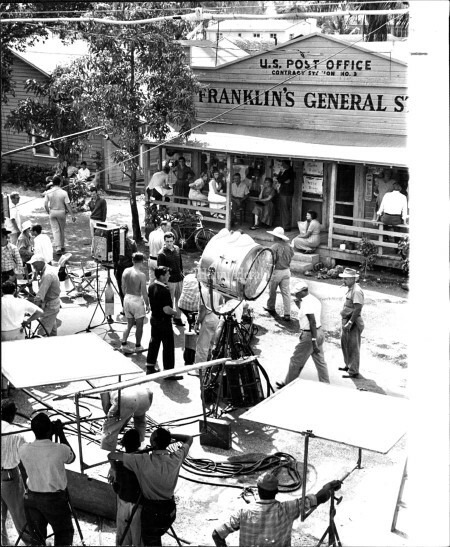 Stars and producers of Warner Brothers' "Wind Across the Everglades" will descend on Miami today for a three day marathon of activities. 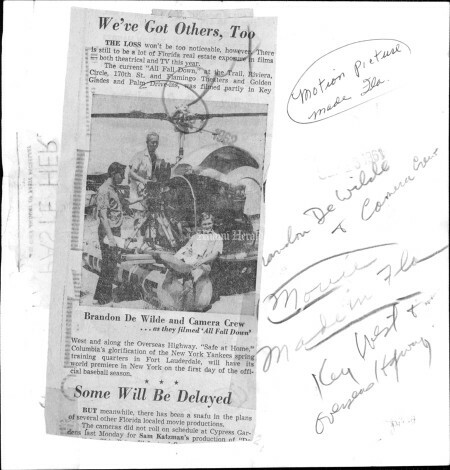 Two days of luncheon appearances, newspaper interviews and TV and radio spots are in prospect for Gypsy Rose Lee, Tony Galento, Sammy Renick, and Stuart and Budd Schulberg. 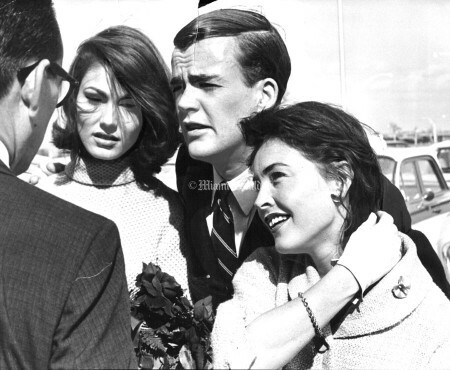 1959: CARY AND DINA SMILE HAPPILY FOR PHOTOG TONY. Cary Grant and Dina Merrill prove smiling subjects for Tony Curtis' camera while on location in Key West, Florida, filming scenes for "Operation Petticoat," starring Grant and Curtis. 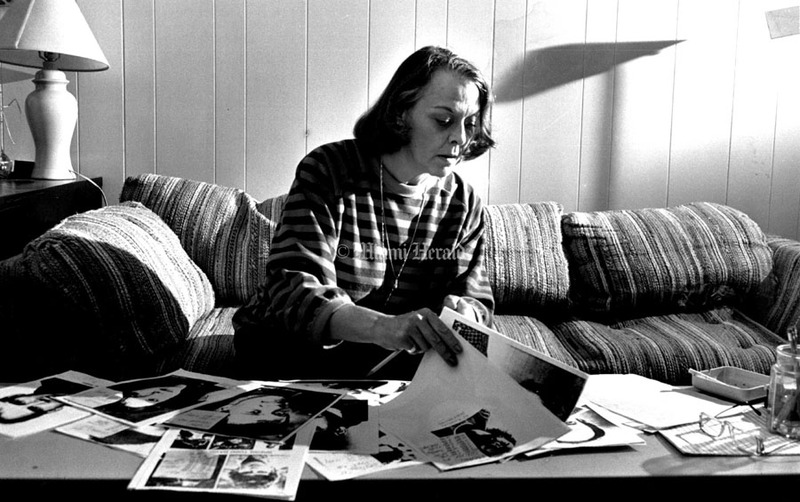 Tony is a keen camera enthusiast and has thousands of feet of home movies of his wife, Janet Leigh, and the couple's two youngsters. 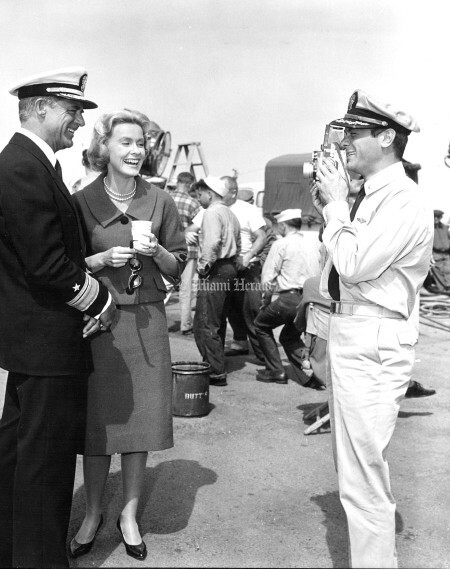 1959: Dina Merrill poses for the camera to promote "Operation Petticoat". 12/19/1960, Ron Wahl/Miami Herald Staff: Stars of "Where the boys are". 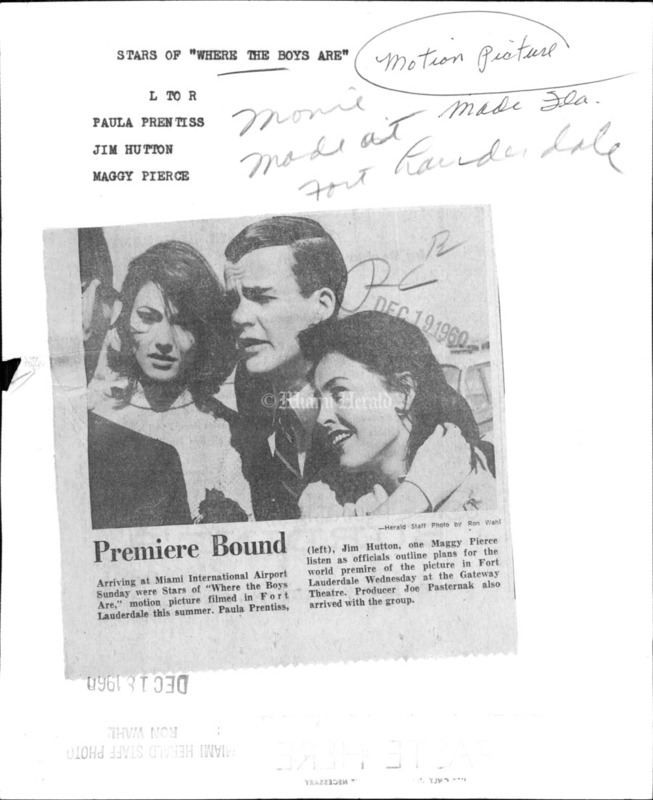 L to R: Paula Prentiss, Jim Hutton, Maggy Pierce premiere bound. Arriving at Miami International Airport Sunday were Stars of "Where the Boys Are," motion picture filmed in Fort Lauderdale this summer. Paula Prentiss, (left), Jim Hutton, one Maggy Pierce listen as officials outline plans for the world premier of the picture in Fort Lauderdale Wednesday at the Gateway Theatre. Producer Joe Pasternak also arrived with the group. 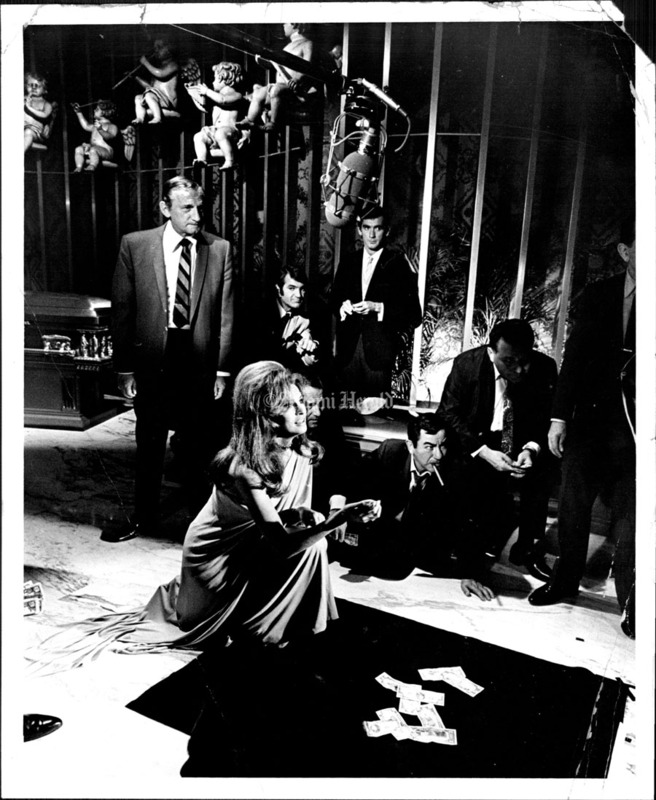 3/5/1968: Miss Welch Shooting craps in the scene at the Fontainebleau for the filming of "Tony Rome". 4/12/1961: Set of the movie 'Pity Me Not' on Grand Ave just west of Douglas in Coconut Grove. 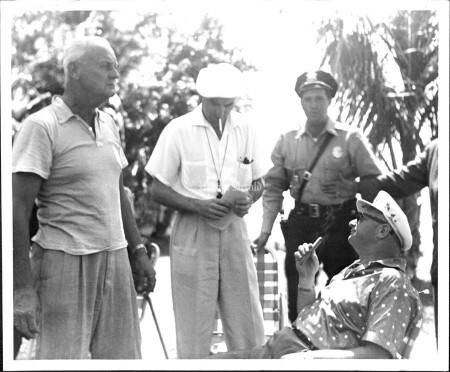 1956: "Miami Expose" Sam Kalzan, Josh Westmoreland, L. Gene Anderson, Jr.
1967: No set construction needed for this scene of "The Happening" with Miller Earle (in the) and Anthony Quinn. 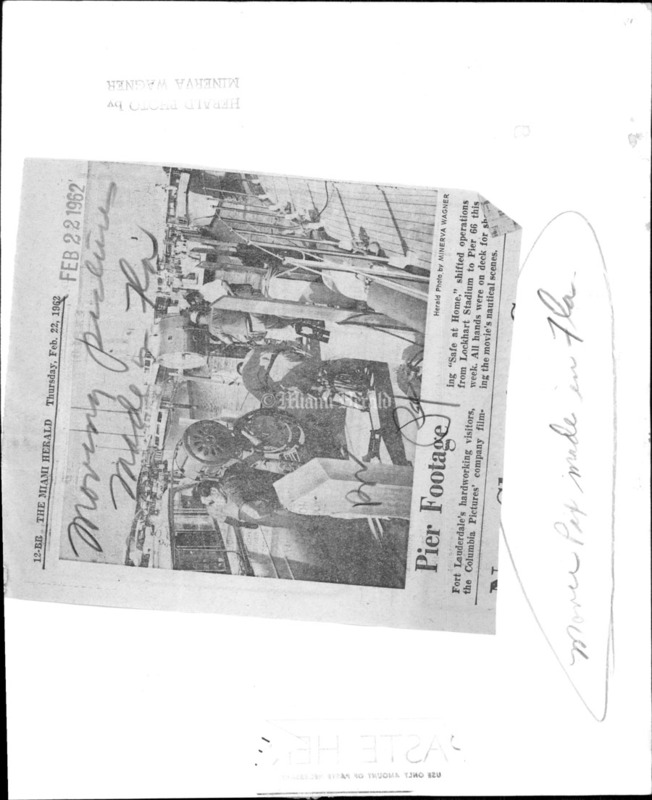 Actual broiler kitchen of the Americana Hotel was used. 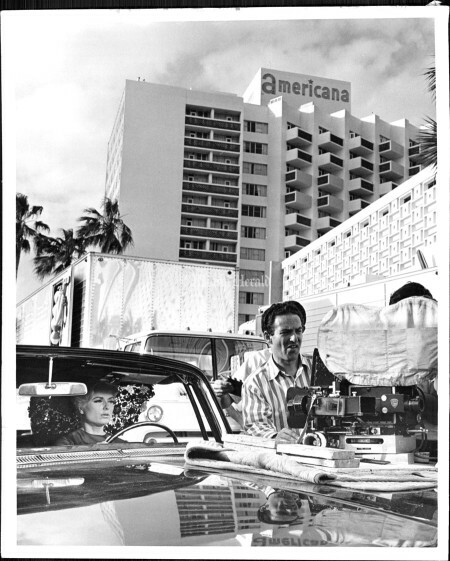 Undated: "Eternal Summer" shot in Miami is a realistic story of real life people shot in real homes, offices, hotels, bars and even on the Beach. 1966: Director Elliot Silverstein and Actress Martha Hyer making "The Happening" in Miami. 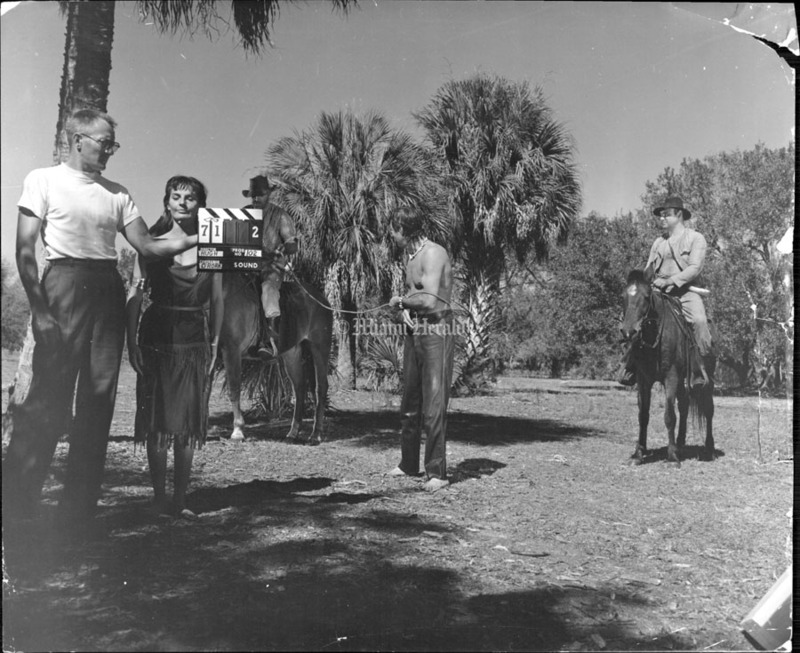 1957: Florida scenery backgrounds are authentic for "Naked In The Sun". 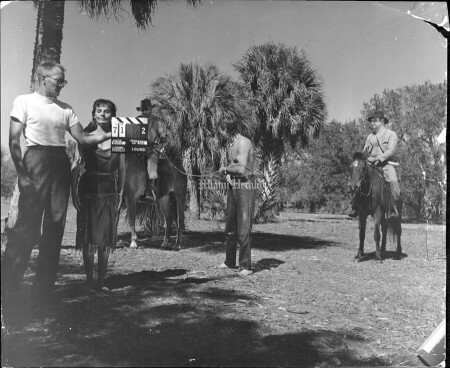 Lita Milan and James Craig co-starr in the "Empire Studios forth-coming release of the all Florida movie "Naked In The Sun", filmed in Eastman Color the production was directed and produced by R. John Hugh. 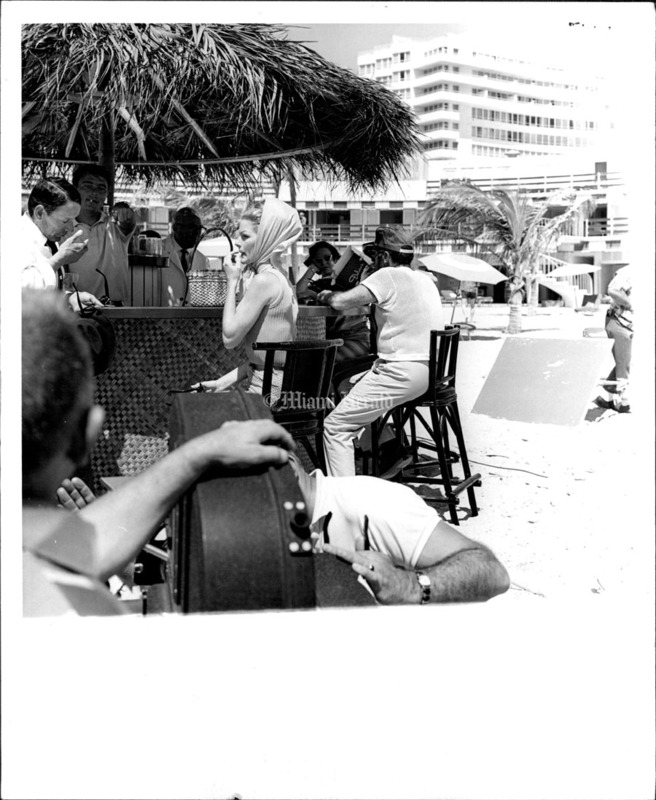 4/8/1967: Frank Sinatra (left) during filming on Tony Rome at the Fontainebleau. 9/17/1966, Bill Kuenzel/Miami Herald Staff: Dolores Carlos and Don Eakes during the filming of Hideout in the Sun. Parts of the filmed were done at the Miami Serpentarium. 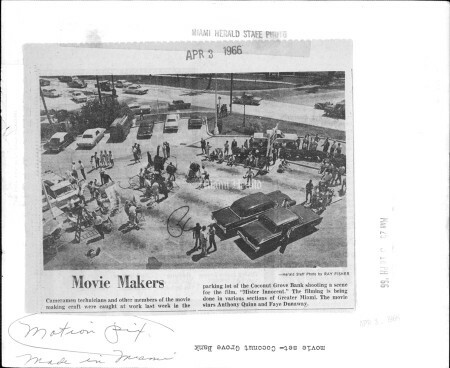 3/25/1966, Miami Herald Staff: Movie Makers. Cameramen technicians and other members of the movie making craft were caught at work last week in the parking lot of the Coconut Grove Bank shooting a scene for the film Mister Innocent. The filming is being done is various sections of Greater Miami. The movie stars Anthony Quinn and Faye Dunaway. 3/1/1961: Filming a TV series like "Miami Undercover" brings jobs to hundreds of Miamians. 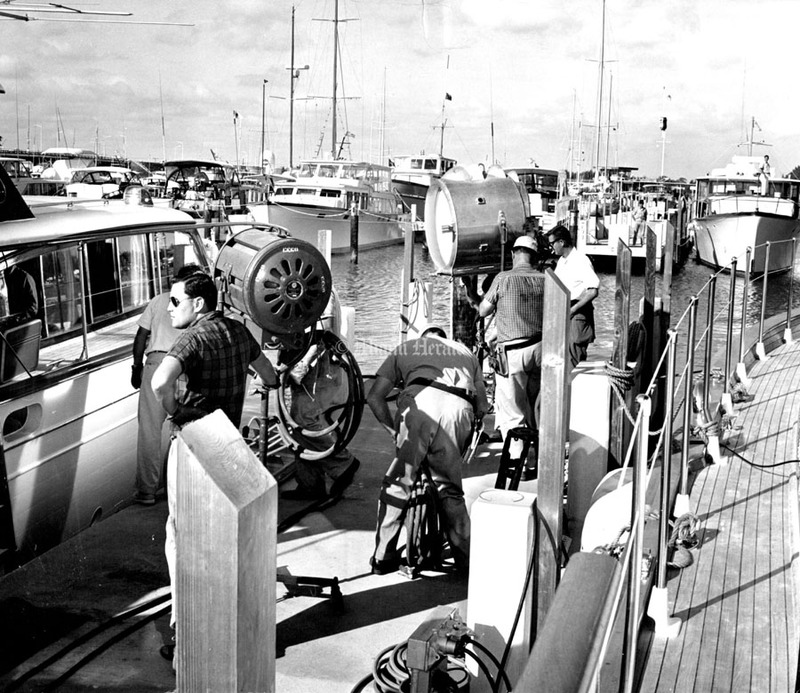 Here, part of the cast and crew are assembled for a scene at Pier 5. 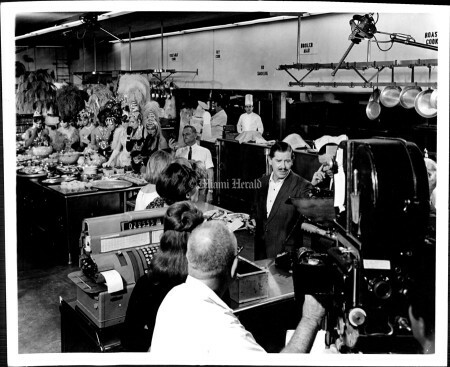 Miami's film colony is enjoying a period of rare to head this way during 1961, many of them attracted by the top notch facilities of Howard Warren's Film Sound Center on Miami Beach. 3/20/1989, Raul Rubiera/Miami Herald Staff: Dee Miller a casting director working currently - on the casting of Thunderbolt Row. 9/01/04: MIAM BEACH -- The growth of the film and television industry brought jobs in front of the camera and behind the scenes. 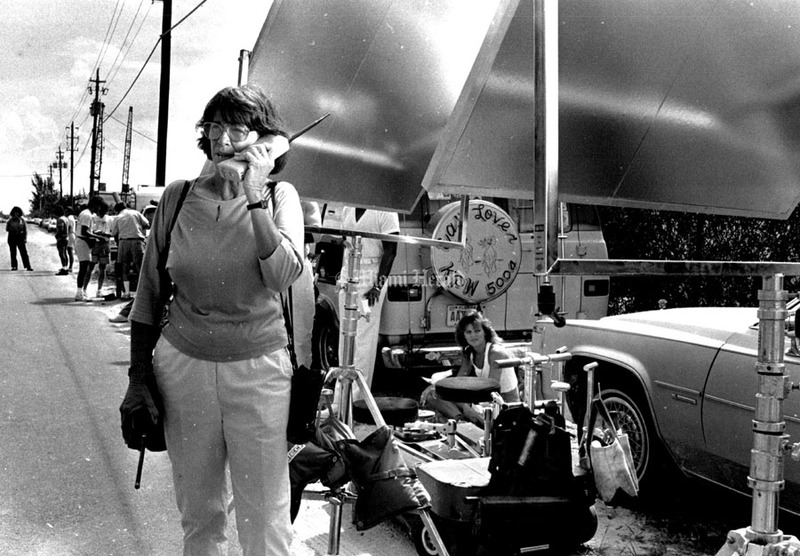 Here, a film crew shoots a scene from "Scarface" on Ocean Drive in April of 1983. 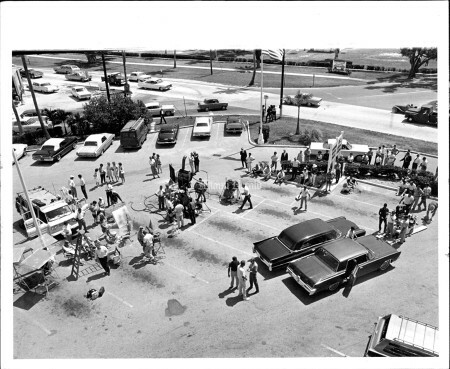 Shot ran 4/21/83. Herald archive photo.